Porter Square Books will open a second location in Boston’s Seaport District, taking a ground floor space in a new literary center that will house the creative writing non-profit GrubStreet and the poetry non-profit Mass Poetry. GrubStreet executive director Eve Bridburg made the announcement at the organization’s annual Muse and the Marketplace conference at the Boston Park Plaza Hotel on April 6. GrubStreet’s Bridburg has led the effort to create the facility, which will house classrooms, offices, a performance space, a café and the 1,300 sq. ft. bookstore. “We’ve always thought of Boston as a literary city, but this marks a true turning point,” Bridburg said. The addition of a second store would have been impossible a year ago, Sandberg said, but with the implementation of a financing agreement that gave 10 of the Cambridge-based store’s booksellers an ownership stake in the store, they were able to consider expanding operations. PG says that, with the second and third floors occupied by nonprofit organizations, he hopes Porter Square Books makes some money to keep the building’s finances afloat. LifeWay Christian Stores plans to close all of its locations by end of the year and move all of the company’s retailing online. Its bricks-and-mortar division has been losing money since 2013, and the company says it’s tried just about everything to keep the business going, including overhauling several stores last summer and experimenting with features like coffee bars. “That’s kind of when we knew that we were going to have to make a change,” says chief executive Brad Waggoner. The company didn’t get into retail until about three decades ago, when box stores like Barnes & Noble and Borders were taking off. But those chains typically devoted just a few shelves to faith and spirituality. “The brick-and-mortar strategy was there to be salt and light out in those communities and to assist churches in doing what they do,” Waggoner says, referring to Biblical verses that call on Christians to be the “salt for the earth,” and “light of the world.” “So it’s always been motivated by the ministry impact,” he continued. Rachel Held Evans is a Christian author who grew up in an evangelical household in Dayton, Tenn. Today she identifies as Episcopalian and writes about her struggles with faith, including Christianity’s historic relationships with women and LGBT people. She says the chain’s large presence in Christian bookselling has affected authors — even those, like her, who aren’t published by LifeWay. Evans hopes LifeWay’s decision to get out of bricks-and-mortar retail will loosen up Christian publishing. But, she confesses, a bit of her still hates to see another bookseller close its doors. Barnes & Noble is predicting a fraught chapter ahead, slashing its profit forecast and sending its shares down 12.5 percent. Its stock price is cheaper than the cost of a children’s paperback. The dismal holiday quarter and lower-than-expected outlook may raise questions about Barnes & Noble’s strategy as it continues to battle rival Amazon.com, as well as resurgent local booksellers. The company said its online sales fell as well, even as online sales are generally growing for most retailers. At the same time, Barnes & Noble remodeled 91 stores, but the payoffs of that investment aren’t yet clear, its executives said. But it’s not only books that are suffering at Barnes & Noble. The store, known for a place where readers can grab a cup of coffee while browsing the shelves, also saw “slowness” at its cafes. On top of that, sales for seasonal gifts and the tchotchkes it sells as “impulse” purchases were slow. Red Emma’s Bookstore Coffeehouse is a radical infoshop located in Baltimore, Maryland, USA and run by a worker-owner collective. 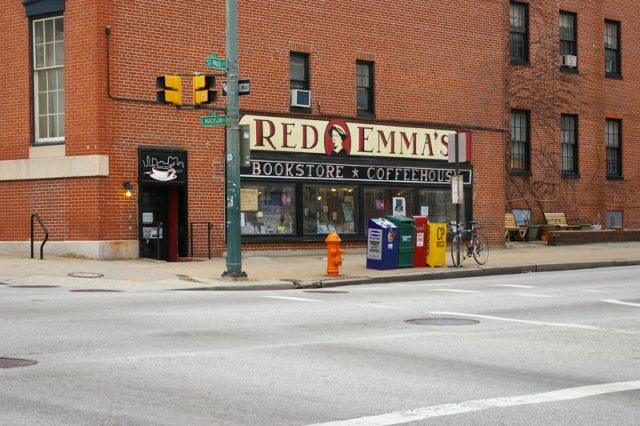 Named for anarchist Emma Goldman, Red Emma’s opened in November 2004 and sells fair trade coffee, vegetarian and vegan foods and books. The space also provides free computer access to the Baltimore community, wireless internet and film screenings, political teach-ins, and community events. Since before the official opening in 2004, all decisions regarding the operations of the space have been made by consensus. The collective of worker-owners has ranged in size from 10 to 20 over the 7 years the shop has been open, usually hovering around 15. Collective meetings are open to the public. The Red Emma’s Collective is a closed shop, organized with the Industrial Workers of the World. That means that all collective members are also members of IU 660—the “One Big Union”. Boom Time for Used Booksellers? As PG was opening a couple of packages of hardcopy books for Mrs. PG (she does read a lot of ebooks, but, in some cases, used books are less expensive and some books she wants in hardcopy to share with family and/or friends), it occurred to him that Amazon has almost certainly given used booksellers an opportunity to reach a far wider group of prospective purchasers than were ever available to them in physical used bookstores. Most of the hardcopy used books that arrive in the mail come well-packaged and most are clearly packed by more sophisticated equipment than a roll of stamps and a stack of envelopes. So, is PG correct about Amazon and used booksellers? Has the ability to sell to a much wider online audience affected the pricing of used books? Has the used book business undergone consolidation with small used bookstores closing and selling their inventory to large, online-focused used booksellers? Are there people who are paid by larger used booksellers to be scouts for large quantities of available used books? The book publishing industry experienced a slight shift in 2018. Print book sales are rising, and independent bookstores are doing better compared to past years. The shift is that after years of rising numbers, e-book sales are stagnant in favor of physical books. Some news outlets suggest print books could be becoming more popular. By November 2018, e-book sales slipped 3.9 percent last year, according to the Association of American Publishers. Hardback and paperback book sales grew 6.2 percent and 2.2 percent respectively. During the first nine months of 2018, hardback and paperback sales were at $4 billion combined, while e-book sales were at $770.9 million. Piacentini said. Readers can use the service on their phone and listen to the books in their car using Bluetooth. They also sell e-books, but rarely. The number of independent booksellers increased by 35 percent from 2009 to 2015, according to the ABA. Last week at Winter Institute 14 in Albuquerque, N.M., five of the past presidents of the American Booksellers Association sat for a panel discussion moderated by ABA CEO Oren Teicher, focusing on where the industry is at the moment and where it is headed. The conversation echoed several others at Winter Institute, where it became clear that the ongoing collaboration between publishers and booksellers to reduce the cost of goods and streamline delivery times is central to the profitability of many booksellers. Michael Tucker, ABA president from 2009 to 2011, and president and CEO of Books Inc., headquartered in San Francisco, with 11 stores in California, acknowledged that this key relationship is “in a better place” than it had been during the period following the settlement between the ABA and the publishers and bookstore chains for anti-trust in 2001. For several years thereafter, tensions in the industry were high. “The challenge was to open up a dialog with the publishers,” said Tucker. Several times at Winter Institute Teicher and others pointed out that sales in the indie channel have been improving overall, with sale up some 5% in 2018. That said, there are still issues, particularly among the bottom third of bookstores, which are averaging a net loss of 8% per year, according to the most recent ABACUS data presented by the ABA earlier last week. One supposition is that profits are rising due to an increase in sales of non-book items and smaller footprint stores are struggling to raise profitability as a result of their inability to stock as many of these higher margin items. Mitchell Kaplan, president of Books & Books, headquartered in Coral Gables, Fla., who held the ABA presidency from 2004 to 2006, said that the path to profits leads through community work. “We need to look at what the challenges are for small business today, whether that is rent, bad landlords, or a main street that is falling apart. We need to figure out for our communities how to sharpen what we do.” He pointed to the grants the city of San Francisco recently extended to small businesses, including a handful of booksellers, as one possible model.